Many New Yorkers claim that neighborhood rezonings lead to the displacement of existing residents–yet have lacked data to back-up their assertion. Queens City Council Member Francisco Moya introduced legislation last week that aims to provide such data. His bill calls for the city to study the effect of each neighborhood rezoning and to see whether area residents are in fact displaced. The bill, Int.1487, would require that every neighborhood rezoned after Jan. 1, 2015 be studied five years after, meaning that the first of such studies would take place in 2020. From each rezoning’s five-year mark, the city would have six months to conduct the study and report its findings to City Council. If enacted, Moya’s bill would equip residents slated for neighborhood-wide rezonings with data on how other communities were affected. “Good data inspires good policy and if we’re going to overcome this city’s housing crisis, we’ll need both,” Moya said. The Queens Plaza/Court Square area is one of 15 neighborhoods that Mayor Bill de Blasio said in 2015 he would like to see rezoned. Several neighborhoods on that list have since been rezoned such as Inwood, East New York and East Harlem. 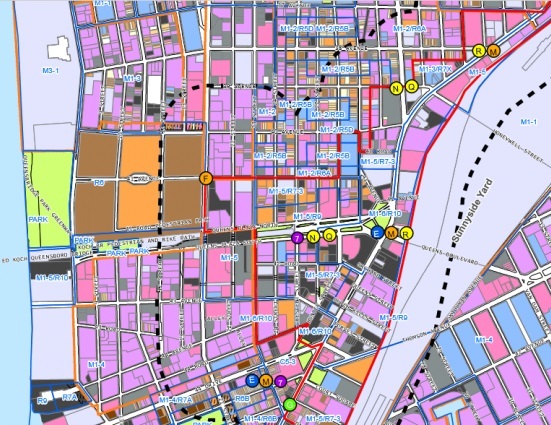 In 2017, the Department of City Planning started studying a 50-block section of Queens Plaza/Court Square—as part of the LIC Core Study–which was to be the precursor for a rezoning. 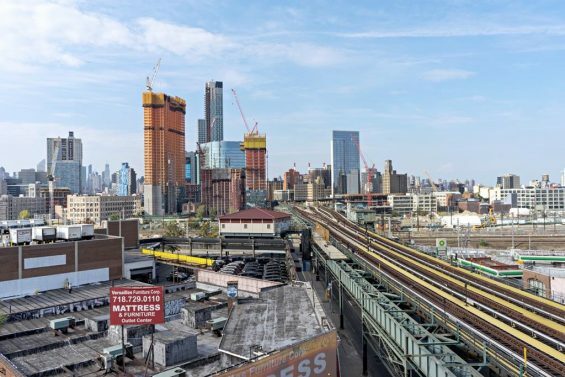 Many Long Island City residents have been skeptical of the prospect, though, citing a 2001 rezoning of the same Queens Plaza/Court Square area that sought to turn the area into a vibrant business district but instead resulted in a luxury tower boom. Although the city says that the new rezoning would seek to correct the unintended consequences from 2001, some residents fear that it would instead accelerate gentrification and price existing residents and business owners out. Although plans for Long Island City have yet to move forward, if the city were to try to move ahead next year or any time after, residents may have access to the earliest studies spurred by the bill. “Neighborhood-wide rezonings are sold as efforts to increase our stock of affordable housing, but, if we look at where these massive rezonings are being applied, all too often we see lower-income New Yorkers of color being displaced from their communities,” said Javier H. Valdés, Co-Executive Director of Make the Road NY. The city does try to estimate the amount of secondary displacement a rezoning is likely to trigger as part of the City Environmental Quality Review (CEQR) process before it is approved. However, studies resulting from Moya’s bill would allow the city to compare a rezoning’s original estimated secondary displacement figure with the actual amount of secondary displacement it caused. If a study finds five percent or more secondary displacement than the original CEQR estimate, it would recommend improvements to the CEQR manual to more accurately estimate displacement in the future. Moya, who represents Corona, East Elmhurst and LeFrak City and chairs the Subcommittee on Zoning and Franchises, has four co-sponsors for his bill. People and families live here, children attend schools. People have Doctors they see here. The entire lives are rap up into this communities. Now you want puch them out. Like putting Indians on the reservations. Now they surfing and no one gives a dam! This all about water front. Sad how the poor gets treated. The Indians owned the land stolen from them, at best you rent. thanks for reporting on this. It does cause displacement and we already have studies but another one is in order. Patrick, I don’t know who does these “studies”, but they must not know anything of what they are doing. LIC has been RUINED forever and myself and many others ant to LEAVE ASAP. This is becoming “Manhattan ” Overcrowded and Overpriced. It is a antiseptic area. Too many people who don’t care about their neighborhood. Too many people stay here for a year or two and get out. NYC ‘s economic situation pushes many out. I mean transit over crowded , traffic is getting worse, Planning too many developments/hotels without proper planning for transit and traffic etc.. At night LIC is basically a ghost town. Stores won’t come here because rents are too high as are Apts/Condos. LIC becoming a plaace for the well off and richMaybe that is what the Mayor and Gov. want, most sensible people do not. I will say this again. The Court Square West Dead end street has not been paved in 17-18 years. People who live nearby notice the neglect. There are now Trucks tearing up the street everyday. These Trucks park illegally overnight at the end of the block, load from truck to truck near the courthouse at night and they don’t get ticketed, WHY? these things other people have noticed and have e-mailed Jimmy Van Bramer and Community BD.#2 myself included. People again see no response on this and I am sure other things. Get rid of those Stupid Planters that are on Jackson Avenue.People can’t see oncoming traffic when they are in the middle of the median. LIC is now just a DUMB Project gone awry. “Their” neighborhoods. Did they build them? Didn’t think so. Answer is YES< YES< YES< YES<YES. It is called GENTRIFICATION. It displaces people with (REAL MIDDLE INCOMES) not the so called newer higher middle class that they talk about and of course lower income people will be forced out. (Come on developers pile on those dislikes) you sponsor this site so go ahead and tell people BS. We the public know that what they call (Affordable Housing) is really not affordable or it would displace no one. Greedy Developers get their cushy taxpayer subsidied breaks for 10 or more years and the people paying for those tax breaks get PUSHED OUT of their own neighborhoods that they lived in, sometime all their lives. People know the line of BS you are trying to feed them , REZONING = Gentrification and displacement of middle and lower income. Well said, deeper due to banks selling mortgage back securities mixed with a,b,c credit, and banks betting on gains and losses over mortgage backed securities with credit default swaps, caused this whole inflationary real estate market in the first place… bankers ain’t so patriotic you think! Affordable housing is housing that you can afford on your own, not subsidized housing to let you live someplace because it is where you have lived for a while. Change happens. Evolve or go the way of the dinosaurs. Right on Frank, buy or bye bye your call. Why did you vote for a billionaire luxury developer giving MASSIVE tax breaks to the rich and then pretend to care about the middle class? How about Governor Corruption Cuomo that YOU probably voted for. He put back tax breaks for developers not Trump ater they expired. If you did not vote for Cuomo I apologize. NYC put him in not upstate where the vote was about even. In NYC he had a 71% -14% advantage. Agreed, Trump gave MASSIVE tax breaks to the ultra-rich. “Also, some other people did some stuff once” is your whataboutism.